After I finish reading a book, I always like to hear what its author has to say about it. So I search for an interview with her/him on YouTube and feel lucky if I find one. 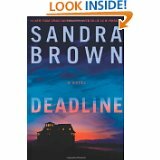 Here’s what Sandra Brown says about her latest thriller, Deadline. Isn’t it amazing (and admirable!) that Ms. Brown went to Afghanistan to talk to our troops? Wow! She is not only talented, she is courageous! I find it interesting what she says about choosing the right title for a novel. Deadline definitely fits for this one. I just wrote a short review of Roxana Robinson’s Sparta, a novel about a U.S. soldier’s adjustment to civilian life upon his return from Afghanistan, and now I finished another book related to this topic, Sandra Brown’s Deadline. A similar topic, different genres. And what a difference it makes! Sparta is a psychological drama the believability of which makes your heart ache, whereas Deadline is an entertaining thriller, with nerve-racking danger and hot romance. In Deadline, Dawson Scott, an award-winning journalist, comes back from Afghanistan where he covered the current events, focusing on the heroic actions of the American troops. Suffering from PTSD and haunting memories, he wants nothing but a few weeks’ rest. But rest is denied to Dawson: Gary Headly, an FBI agent and Dawson’s friend, asks him to go to Savannah, Georgia, to cover a murder trial that involves Marine Captain Jeremy Wesson, a decorated war veteran who had done several tours in Iraq and Afghanistan. Agent Headly suspects that this case may be connected to another case, involving domestic terrorists, that he failed to solve almost forty years ago. For Dawson, it could be a Pulitzer Prize worthy story, which is what he has been after throughout his journalistic career. So he agrees. Dawson Scott gets much more than he bargained for: There is another murder; there is a dark secret; there is unexpected love; there are shocking revelations; and there are menacing threats. Dawson came from Afghanistan in one piece, if damaged emotionally, but now his life is in danger again, as well as the lives of the people he cares about. It is his courage and his swift actions that can avert the worst outcome. If you like thrillers with nail-biting suspense, you will like Deadline. Its twists and turns and cliffhangers in every chapter will make you turn pages until you finish it. Below is a very short clip from an interview with Roxana Robinson, the author of Sparta. You may have the same question that I had about Conrad Farrell, the protagonist, and here’s Ms. Robinson’s answer to it. 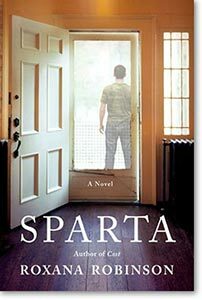 Roxana Robinson’s Sparta is a novel about the estrangement from society and normal life that modern soldiers experience upon their return from war. It made my heart ache from the first page to the last. Conrad Farrell, a college graduate majoring in classics, was inspired both by the classical writers glorifying war, honor, loyalty and commitment, and the recruiters on campus giving inspirational speeches about the Marines. Conrad wanted a great challenge in his life; he wanted to do something serious; he wanted to become a man. He joined the Marine Corps. After four years in Iraq, Lieutenant Farrell gets an honorable discharge from active duty and comes back home to Katonah, New York. He has become a man—mature, competent, brave, respected. He is ready to be a civilian again and pick up where he left. He doesn’t fit in here anymore. At the officers’ training school and in-country, he was taught how to detach himself from civilian life, but no one taught him how to reconnect with it. Civilian life has become a “parallel universe where he is absent.” He can’t even explain his confusion. He says to his family that he “feels as though he’s standing outside. He can see everyone in here, rushing around and doing things, and he can’t get in.” So he can’t connect with them or with his girlfriend. He knows that he’s safe now, yet there are so many things around him that trigger his panic attacks, bringing flashbacks of the terrors in the war zone, thus causing headaches, insomnia, and paranoia. Conrad has all the symptoms of PTSD, but he feels ashamed to seek medical help. In-country, admitting any weakness, emotional or physical, was betrayal of trust. As a commanding officer, he could never admit fear. Now he’s back home, but he still thinks of himself as a Marine. Recording his problems on paper at the VA “would be failing as an officer.” He doesn’t want this to be on his record. He’s afraid that people would feel disgust toward him. Throughout the book, the tension was building up, making me feel as if a bomb was ticking, ticking, and any minute it would go off. At the end, I couldn’t even see the print through my tears. I cried buckets. Roxana Robinson is a wonderful, extremely talented writer. I was fortunate to hear her speak this summer at the annual National Book Festival in Washington D.C., organized by the Library of Congress. She introduced Sparta and talked extensively about her research for the book—reading documents, meeting with war veterans and their families, as well as the enormous challenge that she, a Quaker with a conscientious objection to any war, had faced while writing the novel. No, she doesn’t judge, but she surely understands what it’s like to fight in war, and she makes us understand the challenge that our soldiers face both in-country and back home. To me, both experiences seem heartbreaking. I highly recommend this masterpiece. Five stars! Back in March, I wrote a short opinion on Emily Giffin‘s Heart of the Matter, and received a vehement disagreement on it from one of the readers. Well, tastes differ, don’t they? I personally loved the novel and would recommend it to fans of good romance and to those who love reading about moral dilemmas. 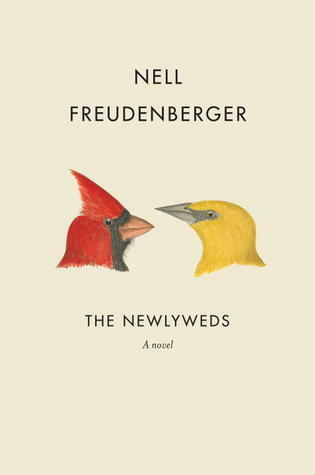 Nell Freudenberger’s The Newlyweds is a fascinating story of two people marrying for the wrong reasons. You’d think what can you expect from a marriage of two people that knew each other only through correspondence? From a marriage that isn’t based on love? Amina Mazid, 24, and George Stillman, 36, meet online, both hoping to fall in love and marry. George flies to Bangladesh to meet her in person, they like each other, and eventually Amina joins him in Rochester, New York, where they get married. And then their problems begin. Of course, all newlyweds go through an adjustment period, stressful and even painful sometimes, and the Stillmans are no exception. Only their problems are deeply rooted in different expectations from their union. They’re both decent people, and they both want the marriage to work, but they find it difficult to communicate their wishes to one another. Basically, it’s a proverbial fairy tale of a mail-order bride that I explored in my novel, Without Thinking Twice. Different backgrounds, different cultures, interests, education, temperaments, values, religions, you name it. Thus, inevitable clashes, resulting in heartache and disillusionment. The Newlyweds is a fine novel, rich in description of cultures and feelings, with well-developed characters, and a captivating plot. But I was disappointed in its ending, namely Amina’s decision regarding her marriage. By saying that, I don’t think I’m giving away a spoiler because other readers might find it quite satisfying.